In 875 news arrived that King Harald Finehair of Norway’s fearsome warlord Jarl Rognvald had conquered the islands off the north coast of Britain, from the Orkneys to the Hebrides to Mann: the lands that many of the Westmen call home. His army had also landed in Northumbria, attempting to bring all the Vikings in Britain under his rule. Meanwhile, the Northumbrians had risen up, wanting freedom from any foreign ruler. The Westmen, Oestvikingae, and Holmbyggjar weren’t having that, and so marched North to fight King Harald off, under Halfdan Ragnarsson’s leadership. Sadly, due to being shipwrecked and then ambushed, they arrived too late for the big battle: by the time they arrived, Halfdan’s men had broken the invading Norwegian army. The Vikings of DAS were sent to look for Jarl Rognvald’s son, Ivar, who rumour had it had been killed in a Northumbrian ambush. With him had fallen his standard, the Raven Banner. Looking for the Raven Banner, many warbands descended on the area where Ivar was rumoured to have died. The Vikings wanted to get it to rally all of the raiders in England to their cause and to demoralise Rognvald and Halfdan; the Englisc wanted to stop any of the foreign kings achieving pre-eminence, to keep the Vikings fighting each other; and some dangerous elite lone wolves from the Norwegian army were hoping to grab the banner and take it back to their forces. After an initially fruitless search, the banner was uncovered by Thorhelm of the Oestvikingae. The Oestvikingae were then attacked by a Norwegian, who was being aided by a Saxon mercanary, Athelstan of the Sumorsaete. As they fled, they ran into the Holmbyggjar, who smashed aside both groups to take the banner for themselves. Halla then took the banner and went into hiding, protecting it to return it to King Guthrum. After a break for lunch, the hunt for the banner continued. With the Norwegians driven out of the area, the Vikings turned on the Englisc in earnest. The Westmen soon overpowered them and captured the banner. 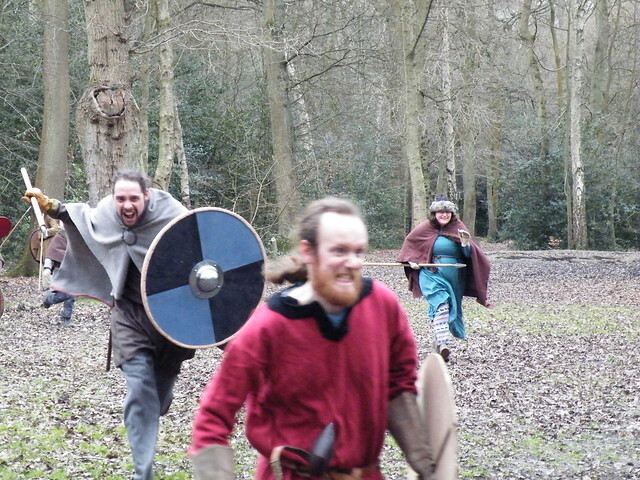 Then the Oestvikingae stole the banner from their hiding place, and the chase was on! The woods descended into madness as people fought for the banner, desperate chases down paths with ended in bogs and holly bushes. At the end of the day, despite a particularly successful stint by Wulfgar of the Cilternsaete as the banner bearer, the Westmen were triumphant and proudly bore the banner out of the woods. That evening, the Holmbyggjar held a great feast. Two mysterious visitors joined the hall. One was from Jarl Rognvald and King Harald Finehair. He said that King Harald acknowledged the victory against him, was retreating to Norway with Jarl Rognvald, and that they revoked all claim to the Kingdom of Northumbria: at which the hall rejoiced. However, he then added that Jarl Rognvald’s brother, Jarl Sigurd, would remain in control of the Kingdom of the Isles, from Mann to the Hebrides to the Orkneys. This distressed the hall, particularly those of the Westmen who called those isles their home. The second visitor was Herjolf Asgrimsson, huskarlar of King Halfdan Ragnarsson. He passed on messages from Halfdan. To the Westmen, successful bearers of the Raven Banner, he said that he entirely supported their claim to the isles which they called home. He would not allow any of his followers to take the isles from them, and would support them in reclaiming the isles from the Norwegian Sigurd. To the Oestvikingae and the Holmbyggjar he offered land. He said that attacking Wessex before we have properly secured our conquests is rash, and that we must completely subdue the North before marching South. 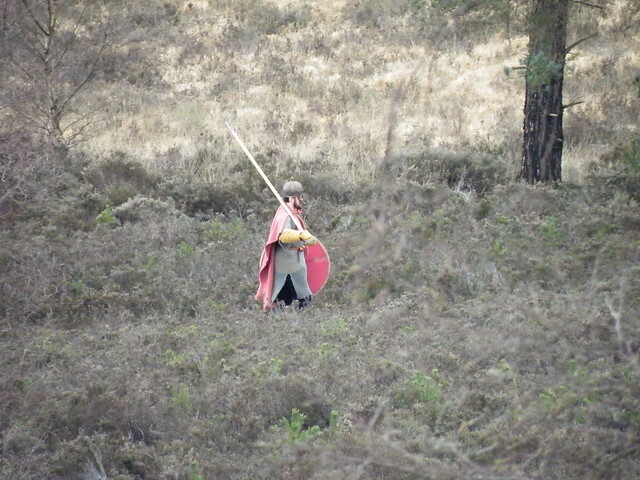 The Holmbyggjar disagreed, saying that they followed King Guthrum not Halfdan, King Guthrum who had offered them (and all who supported him in taking Wessex) land in East Anglia. The time to consolidate our victories is once they are complete, once there is no free Englisc kingdom. And to do that, Wessex must fall. The Oestvikingae were torn. They wanted to attack fresh lands, lands rich in money. But they had previously been loyal to the Ragnarssons, and switching allegiance to Guthrum felt like a betrayal. The Westmen, however, were clear. Following Guthrum and taking Wessex seemed like the best choice, the most strategic. But the Westment never followed the sensible option. And so they would be marching North, to retake their homes, before returning South. Meanwhile, the Englisc sat and listened, biding their time and preparing to carry word of the plans south to Alfred, the last free Englisc king. Whatever was coming, he would prepared… Herewulf Thegn proudly told the story of how Athelstan tricked the lone Norwegian wolf to claim the Raven Banner by pretending to be a mercenary, and his implication was clear: Alfred of Wessex was cleverer than any Viking king, and the Englisc would outfox any invaders just like Athelstan had. The Raven Banner is one of those things that much has been written about, a lot of it rubbish. 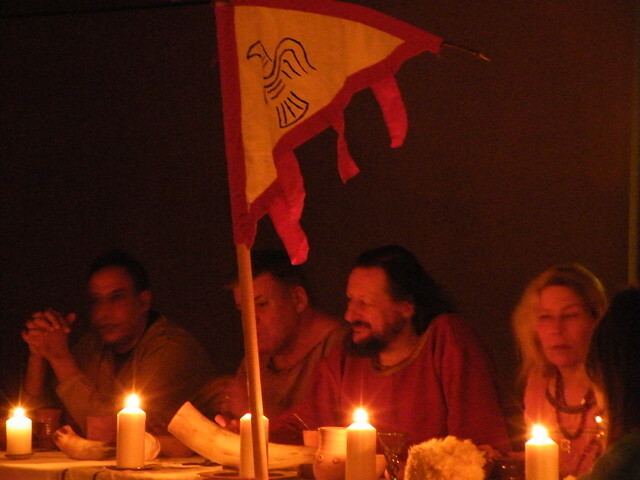 Historically the first appearance of it is in 878, 2 years after our current period, when Ubbe Ragnarsson invades Wessex and took with him “the war-flag (guðfani), which they called Raven”. Later it is also used by the Kings of Northumbria and Norse-occupied Ireland, the Jarls of Orkney, King Knut, King Haraldr at the Battle of Stamford Bridge, and banners with ravens on appear in the Bayeaux Tapestry. In several sources it is magical or cursed: the army that carry it always wins but the banner bearer always dies, or the image changes depending on if they’re going to win or lose, or so on. The only Viking source that depicts something that might be the Raven banner is the coins minted by the last descendant of the Ragnarssons to rule Northumbria, in the 940s. Two of his coins depict banners or ravens, and Hauk combined them to make our version. If you want to read more, the Viking Answer Lady has a very good article. This entry was posted in DAS Chronicle, Uncategorised and tagged 2016, 876, Athelstan, Cilternsaete, Halla, Herewulf Thegn, Herjólf, Holmbyggjar, Jarl Rognvald, Jarl Sigurd, King Alfred of Wessex, King Guthrum of East Anglia, King Halfdan Ragnarsson of Jorvik, King Harald Fairhair of Norway, Northumbria, Oestvikingae, Raven Banner, Sumorsaete, Thorhelm, Westmen, Wulfgar. Bookmark the permalink. Follow any comments here with the RSS feed for this post. Both comments and trackbacks are currently closed.